Four years ago, Tino and Ian opened the doors to Empire Espresso right at the start of the World Cup, creating an amazing and diverse community of neighbors who gathered religiously (as early as 4am) to watch the matches. At times, the crowd spilled into the courtyard, with people standing for hours to catch a sideways glimpse of the additional TV they added to help out with the situation. The final match shown in the courtyard behind Empire on the big screen still goes down as one of the best neighborhood events that I’ve ever been to. We are eagerly anticipating the 2014 World Cup that kicks off this month! Rookies will be World Cup headquarters for all south-end soccer fanatics that need a place to comfortably kick back and view any or all of the 64 matches on our 14 HDTV’s during this exciting month-long event. 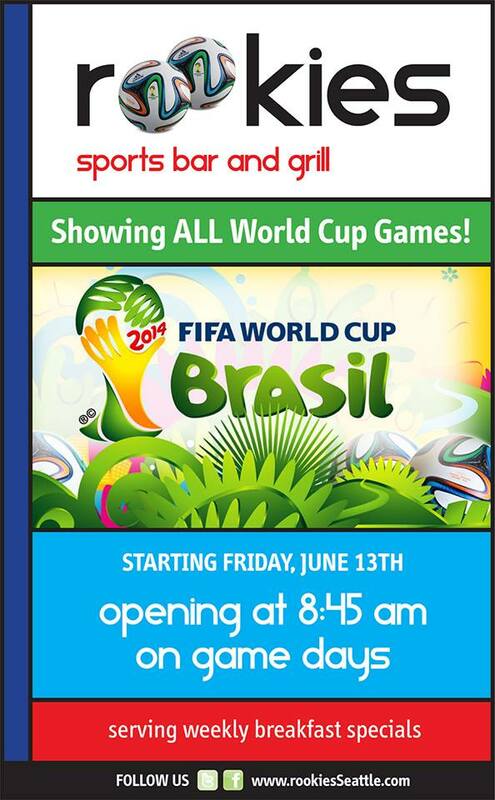 We will open our doors at 8:45 am for all of the early matches and serve up World Cup specials you just can’t beat. Don’t miss out… it only comes around once every four years!